The best restaurants in Times Square, and yes, there is such a thing. You just need to know where to look. Our favorite restaurants in the Theater District. All the best things to eat for lunch in Midtown, from high brow to low brow and everything in between. Eating alone? Here are the best NYC restaurants to do it. Ippudo has landed in Midtown, and you’d think we’d be happier about it. We love the original location, and the food in this new Ippudo is just as good. But we’ve been eating here pretty much constantly since it opened, and it’s starting to become a problem. Apparently a daily bowl of hot pork fat and liquid sodium isn’t part of the ideal health plan. For those of you who are more practiced in the art of self-restraint, this new Ippudo is nothing but great news. You don’t need us to tell you that this part of the city needs better restaurants, and having an Ippudo at your disposal for after work drinks and dinner or Pre-Theater Eats is a game changer. The most important question, though, is how this new location stacks up to its now legendary predecessor downtown. When it comes to the food, we find it to be essentially the same. There are some differences on the menu in terms of the small plates and non-ramen options, but everything we’ve eaten has satisfied like Ippudo should. The room is a bit smaller and certainly more sterile, but that’s to be expected - this is Midtown, and this part of the city is not zoned for cool restaurants. It’s a union thing. But the best thing about this new Ippudo, at least for now, is that you can actually get in. We visited on a recent Saturday night, and the wait at 7:30pm was only about 30 minutes. By 9:00 it was free and clear. We don’t know about you, but we'll trade the aesthetic pleasures of Ippudo number one for the wait times at Ippudo number two any day. Now we just have to figure out that self-control thing. I don’t even really need to say it because everyone agrees with me, but contrary to Steinthal’s stubborn insistence, these are the best pork buns ever. They’re leaner than Momofuku’s, and they have f*cking mayonnaise on them. And don’t even start with me if you’re one of those “I hate mayonnaise” people. Your argument is invalid. An excellent plate of wings that have been glazed in a black pepper sauce. They’re a little bit spicy, a little bit sweet, and a lot delicious. We also love the slaw that comes on the side. Order some. The best bowl of ramen money can buy. This thing is big, rich, and full of porky flavor. A more traditional tonkotsu pork ramen, and probably the lightest on the menu at the Westside location, but that’s sort of like calling a small sumo wrestler skinny. There’s still a lot of weight in this bowl. Yakitori Totto is a Midtown Japanese meat skewer heaven. We typically love ourselves some Michael White. Though his new hotel restaurant Ai Fiori is a sprawling space with more room than they know what to do with. Set inside The Setai, this is a bit of a cookie cutter hotel restaurant - one that isn’t bad, but just isn’t quite our style. Four years after our first review, Danji is still the restaurant we recommend most in the Midtown/Times Square area. Hatsuhana is a good sushi spot in Midtown East that works for business lunches. Blue Ribbon Sushi Izakaya on the Lower East Side is an ideal destination for impressing a big group of sushi, meat, or veggie-loving friends. 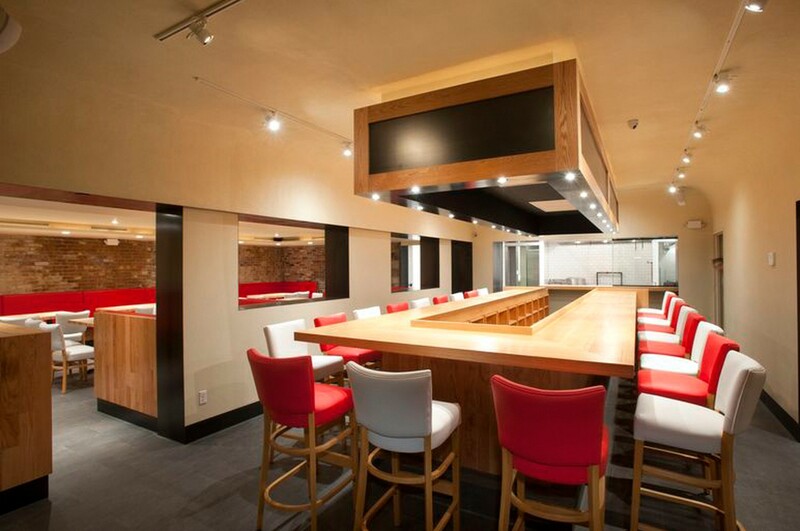 Tetsu is a Japanese restaurant in Tribeca from the chef behind Masa. It’s basically a stand-in for Nobu. Ivan Ramen is an extremely popular ramen spot from Japan, now in the Lower East Side. Five years after it opened, the original location of Totto Ramen is still packed pretty much all of the time. That's because it's still awesome. There are plenty of spots to grab amazing ramen in New York. While Tabata isn’t the best, it’s a great Midtown option. Tabata is nothing fancy, just a straight up soup shop without any bells and whistles.